A finding chart for the discovered variables in the NGC 6652 field, based on a GMOS r image. The position of V14 is also indicated. The fov is 5.5′ ×5.5′ . North is up, East to the left. Credit: Salinas et al., 2018. 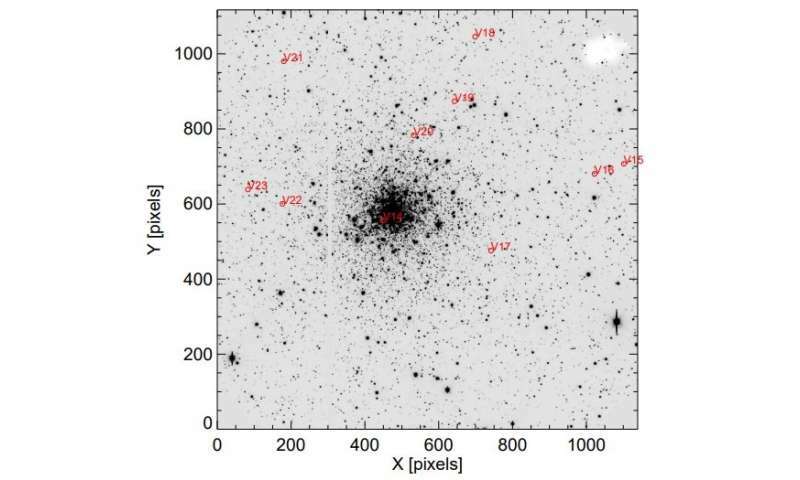 A team of astronomers from Chile has detected nine new variable stars in the globular cluster NGC 6652 and its background stream. Six of the newly found stars were classified as eclipsing binaries, one as an SX Phoenicis star, and two remain unclassified. The finding is detailed in a paper published December 10 on arXiv.org. Variable stars could offer important hints into aspects of stellar structure and evolution. They could be also helpful for better understanding of the distance scale of the universe. In particular, studies of variable stars in star clusters are of special interest for astronomers as they have the potential to help identify systematic errors that affect stellar distance indicators. However, although stellar variability in globular clusters (GCs) of the Milky Way galaxy is one of the oldest branches of astronomy, there are still many galactic GCs in which the census of their variable star content is far from complete. One such understudied cluster is NGC 6652, residing some 32,600 light-years away from the Earth and about 8,800 light-years from the center of the Milky Way, in front of the Sagittarius dwarf spheroidal galaxy. It is an old (about 11.7 billion years), fairly metal-rich galactic globular cluster associated either with the Milky Way's inner halo or the outer parts of the bulge. A group of researchers led by Ricardo Salinas of Gemini Observatory in Chile, has conducted a search for variable stars in NGC 6652 and the background Sagittarius stream. They have analyzed archival data from the Gemini Multiobject Spectrograph (GMOS) at the Gemini South telescope, which resulted in finding nine new variable stars. "We conducted a variable star search on the metal-rich galactic globular cluster NGC 6652 using archival Gemini-S/GMOS data. We report the discovery of nine new variable stars in the NGC 6652 field, of which we classify six as eclipsing binaries and one as an SX Phoenicis star, leaving two variables without classification," the astronomers wrote in the paper. The newly detected variable stars received provisional designation from V15 to V23. V17 is an SX Phoenicis star, while the classification of V15 and V21 is currently unknown. The most interesting find presented in the paper is V17 – a pulsating blue straggler. It is a member of the Sagittarius stream and has a well-defined period of 0.039 days. In general, SX Phoenicis stars like V17 have spectral types between A2 and F5, vary in magnitude by up to 0.7, and short period pulsation behavior varying on timescales from 0.03 to 0.08 days. All known SX Phoenicis variables in GCs are blue straggler stars as they are more luminous and bluer than stars at the main sequence turnoff point for the cluster. When it comes to the six binaries, V16 was found to be a long-period eclipsing binary, V18 a Beta Lyra-type eclipsing binary, and V19 most likely a W Uma type, although a Beta Lyra membership cannot be excluded. According to the researchers, V20 is also most likely of W Uma type, V22 could be a RGB star in an eclipsing system, while V23 is an eclipsing variable of the Algol type.